An interdisciplinary group of students is tending to a bacteria nursery as part of an innovative research project aimed at controlling the seepage of water through soil to control erosion. 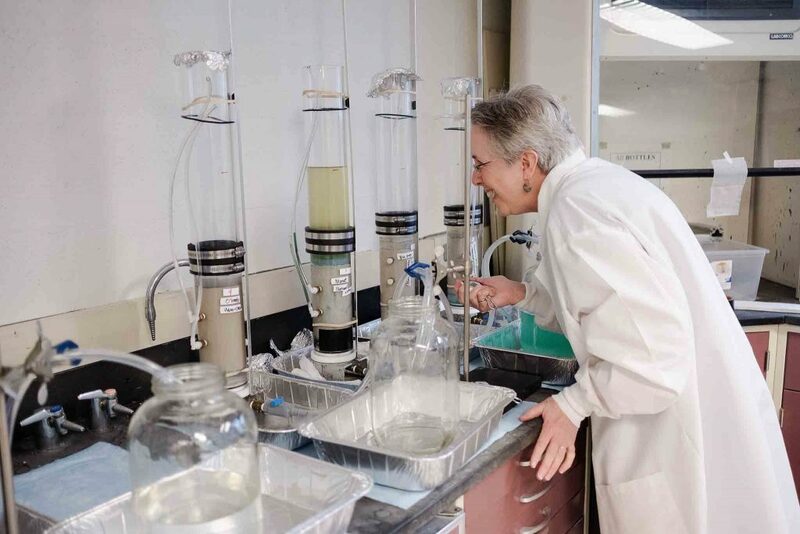 For more than a year, students have been feeding bacteria growing in sand materials that fill six tall acrylic columns on a countertop in a lab at Acopian Engineering Center. Their goal is to grow biofilm, a sticky, sugary-like secretion from the microscopic organisms, in sand and to control growth so that the biofilm is distributed uniformly throughout the sand. If they are successful, the biofilm will fill the small spaces between sand particles, and they will be able to control the speed of water moving through the sand. Funded by a National Science Foundation grant obtained by Mary Roth, head of civil and environmental engineering, and Laurie Caslake, assistant head of biology, the project could lead to a cost-effective and environmentally safe way to prevent erosion around earthen dams and building foundations, Roth says. The work is also being done in collaboration with the National Science Foundation’s Center for Bio-mediated and Bio-inspired Geotechnics (CBBG). The grant covers costs for two students in each of three summers to spend a summer conducting research with faculty and graduate students at one of the CBBG universities. For Roth’s students, the interdisciplinary research is opening multiple doors. Annika Asplund ’19, a civil engineering major, says the work is exciting for her because the biofilm research brings with it a real-world application and exposes her to another field, biology. 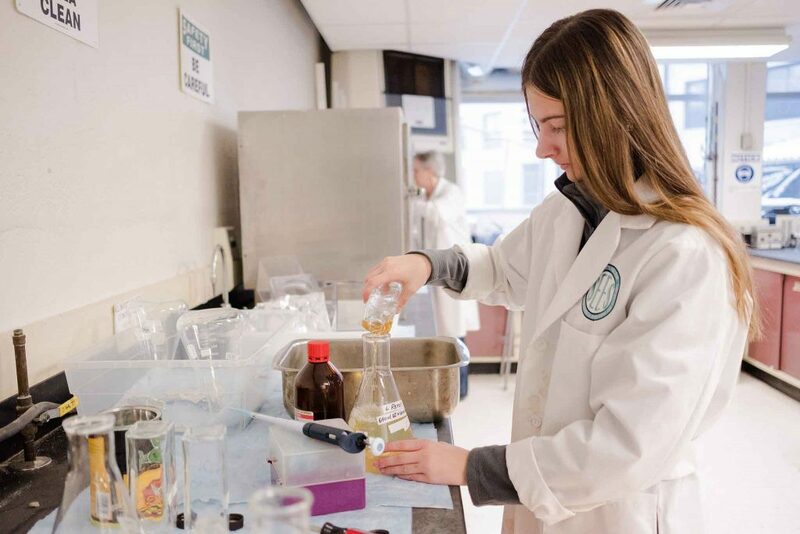 On a recent visit to the lab, she and Megan Mauriello ’19, a double major in art and biology, fed the soil a mixture of sugar, yeast extract, soluble proteins, and other nutrients, and mixed up a batch of blue food coloring in a beaker. They poured it in the top of one of the soil-filled plastic columns and timed rate of seepage as the sand inside slowly turned aqua blue. 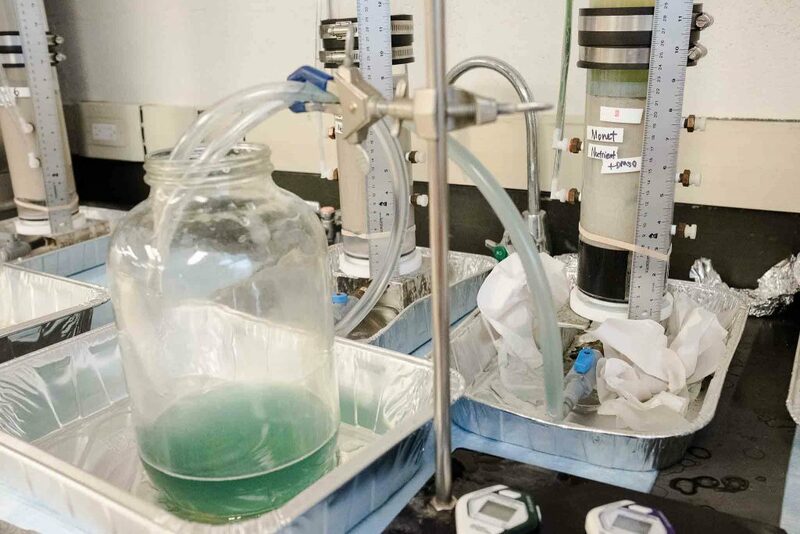 Previous dye tests have shown a dramatic slowdown of the water’s movement as the well-fed bacteria have produced more biofilm to inhibit the flow. In one case, it’s gone from six minutes to two hours. “I really enjoy studying the communication of the bacteria and their response to the glucose and observing the production of more biofilm,” Mauriello says. Two seniors who began their involvement in the project during 2016-17 received a broader view of how research such as this can take on larger implications beyond the controlled conditions in a lab through their experiences last summer at University of California, Davis. The research team is expanding its skills with these experiences, she notes. 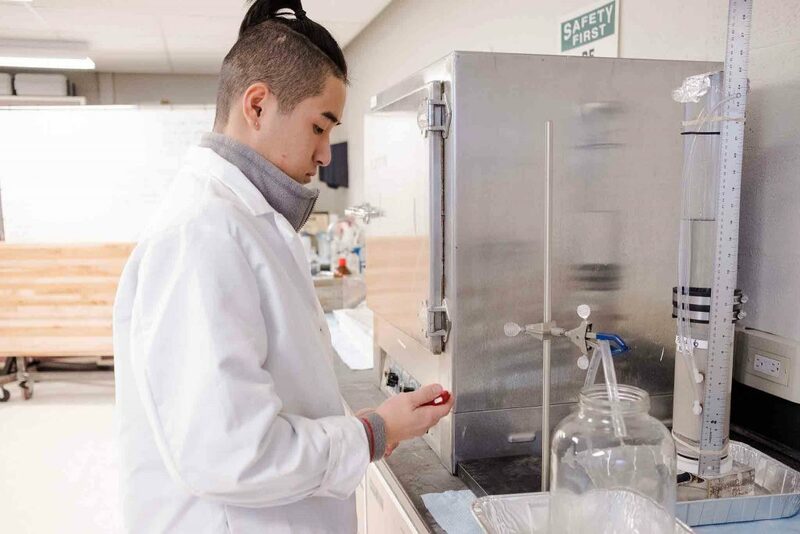 “The biggest thing I learned from my experience at Davis is that things do not always occur as expected during research, and what we can do is accept the challenge, test our ideas, and learn from both our success and failures,” Chen says. UC, Davis offered opportunities to learn about the research environment in a microbiology lab at a leading research university, says Zhihui Chen ’18. Above all, she adds, interdisciplinary research inspires great ideas through collaboration. This research is based on work supported by the National Science Foundation under Grant No. CMMI 1632963.